What is new in NitsLoch 2? NitsLoch v2.0 is a complete rewrite of v1.0. It is no longer based on Gang Wars, although the gameplay is still very similar. The main difference between v1 and v2 is the ability to customize your scenario. You can create all new enemies, weapons, armor, and include many different types of land objects. In short, you can create almost any type of scenario you want as long as it can fit into the style of game that NitsLoch is. Other new features include dungeons and NPCs. The dungeons are represented in a sort of 3D view in the game. You can move forward and turn inside a dungeon. Enemies will randomly spawn as you walk around and fight. You will find ladders in the dungeons that will either take you down a floor or back up. It is up to the scenario designer to decide which enemies can spawn in which dungeon levels. NPCs are also new in v2.0. NPCs are people/objects (depending on the image and description) that can give you useful information. 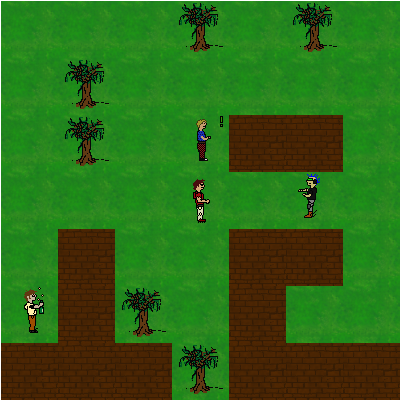 You can use NPCs to create a plot for your scenario. When you move to an NPC, the message associated with them will show up in your message window. Like with NitsLoch v1.0, this version comes with a map editor which gives you the ability to create as many cities and dungeons as you want. The rest of the scenario information is read in from an XML file that specifies all of the enemies, weapons, images etc that the scenario will use. The game uses this XML file along with the map editor. With version 2.1 of NitsLoch, there is a GUI editor (RoofDamager) for the XML files to make it much easier to create a scenario. You should no longer have to edit the scenario XML file directly with a text editor. Punk Wars is the scenario that comes with the download of NitsLoch v2.0. It a medium sized scenario that is fairly hard to beat. It has color images and is a good example scenario to use if you wish to build your own. The Days of NitsLoch is meant to be a humerous but informative set of diary entries written by the main character in the game. Because it contains some helpful hints as to how the game works, it sort of acts like a manual. The GPL NitsLoch project is on sourceforge. Currently, you can download version 1 or 2 from sourceforge. The download for version 2 is here. NitsLoch v2.0 allows you to create all kinds of scenarios and you can find them here. Check our scenario database regularly for new scenarios, and submit your own if you think you've made something special! To submit a map, send it to ddwatts -at- lochnits -dot- com and I'll add it to the database. Please include a readme that at least says how strong the player should be when starting your scenario (a new character, a level 3 character, etc). If you want to, you can even include an exported character that will fit in perfectly with your scenario.